In January 2013, filmmaker Laura Poitras was in the process of constructing a film about abuses of national security in post-9/11 America when she started receiving encrypted e-mails from someone identifying himself as “citizen four,” who was ready to blow the whistle on the massive covert surveillance programs run by the NSA and other intelligence agencies. 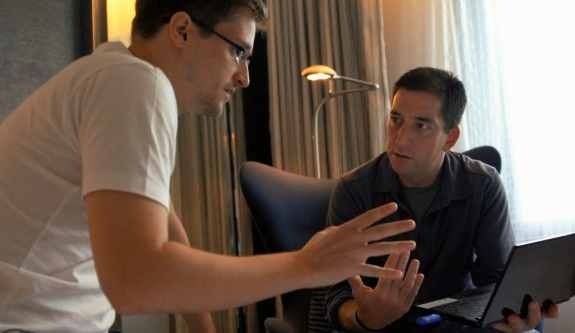 In June 2013, she and reporter Glenn Greenwald flew to Hong Kong for the first of many meetings with the man who turned out to be Edward Snowden. She brought her camera with her. The film that resulted from this series of tense encounters is absolutely sui generis in the history of cinema: a 100% real-life thriller unfolding minute by minute before our eyes. Poitras is a great and brave filmmaker, but she is also a masterful storyteller: she compresses the many days of questioning, waiting, confirming, watching the world’s reaction and agonizing over the next move, into both a great character study of Snowden and a narrative that will leave you on the edge of your seat as it inexorably moves toward its conclusion. CITIZENFOUR is a major work on multiple levels, and a deeply unsettling experience. Directed by Laura Poitras. 2014. USA. 114 min.